ONE TV ASIA presents the next prime time drama, 'The Privileged', that will air within 24 hours from its premiere in Korea! 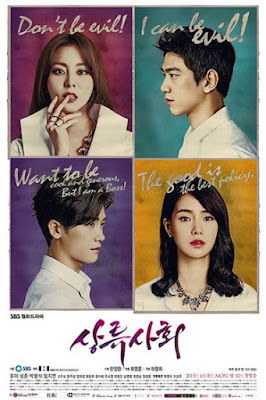 The drama, which had a working title of 'High Society' and 'True Romance', and has just released creative posters! The drama follows the daughter of a rich family as she tries to hide her status in society. Her dream is to find a man who loves her for who she is, but instead she meets a man who thinks love is just a tool that allows the rich to emotionally manipulate others. 'The Privileged' boasts a colourful ensemble of young Korean stars, including After School’s UEE, Sung Joon (Hyde Jekyll, Me) and ZE:A member Park Hyung Sik (The Inheritors). 'The Privileged' will premiere on 9 June, within 24 hours of its Korean telecast. New episodes will air every Tuesday and Wednesday at 8.55pm/ 7.55pm (JKT), first and exclusively on ONE. Viewers in Malaysia can catch the PPALI-PPALI show time on ONE HD, Astro channel 393 which viewers in Singapore can catch it on Singtel TV Ch 513, 604 and StarHub TV Ch 124, 820 and 823 including Singtel TV (on-demand) Ch 514 and 605.